This 4 relay plate allows to control 4 outside loads very easy. Each relay is controlled individually and the setup is very easy. This is a board that allows reading the temperature through a thermocouple sensor and controlling 2 external loads such as fans, Peltier coolers or others. 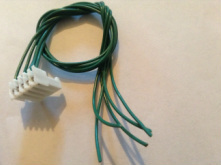 it comes with the thermocouple sensor. This shield is a 3 channel interface for external encoders . It keeps track of the pulses that are sent from encoders. 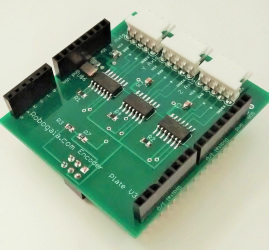 It is based on Invensense IMU 6000 and outputs 3 channels of acceleration on x,y,z axes and 3 channels of rotation on x,y,z axes on a single chip with a high degree of versatility. This a a 5 position connector that fits with the Encoder shield connectors. This small and powerful solid state relay is a versatile tool that can be used as a regular relay or a voltage shifter. Because it does not have mechanical contacts it can drive the load very fast in kilohertz domain .